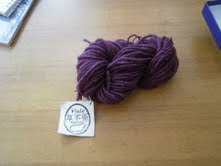 A cautionary tale about losing a car and finding a yarn store. It is not everyday that one has the good fortune to stumble upon a yarn store in Tokyo. But when I do, it is the cause for a minor celebration, or at least lifted spirits and a yarn purchase. A ball of beautiful yarn has so much potential! Just imagine the hat or scarf it could become! The other day I went to interview an architect. I have visited this fellow several times but, like many young Tokyo designers, he keeps changing offices hermit crab style as his practice grows. The last time we met was the first time I visited him on the top floor of an old warehouse-type building in central Tokyo. On that occasion I elected to drive since his office is not far from my home but the subway route is a bit circuitous. When I found a friendly parking lot that seemed close to his office I ditched the car and decided to hoof it the rest of the way -- parking spaces can be very tight in Tokyo so I have learned to choose carefully. After a few minutes on foot, I realized that none of the landmarks on the architect's map were anywhere in sight. So I did what any street savvy gaijin would do: hop a cab and let the driver sort it out! As I was more than a few minutes behind schedule, I was a bit agitated and kept looking at my watch instead of watching the route. Much to my chagrin, I was uncharacteristically late for the appointment and learned subsequently that the architect had even tried to locate me through another architect! Well, the meeting went off without a hitch. After it ended, I went down to the street. And then it dawned on me. I had absolutely no idea where I had stowed my wheels. So I went first in one direction and then in another. And when that did not pan out, I tried a different street altogether. Still no luck and no car. After more than 30 minutes of unfruitful wandering, I came upon a Jonathan's fast food restaurant. I knew there was another Jonathan's near the parking lot so I went inside and asked the counter lady where I might find it. Usually in Japan explanations can be avoided entirely with tidy catch-all phrases. But this time the waitress's puzzled look indicated I needed to clarify if I was to get the coveted information. I was too embarrassed to admit that I had lost my car so I pretended that I was meeting a friend at the other branch. My explanation led to a consultation in the kitchen followed by further interrogation followed, at last, by a hand drawn map. Sketch in hand, I set out once more. I made a few lefts, a few rights and finally ... Eureka! There was the Harrier, calmly waiting for me as if nothing had happened. This time I decided not to take any chances and opted for the subway despite multiple line changes. While driving has helped me put the parts of the city together, subway and foot travel allow me to see and enjoy the fine points that I would otherwise miss. Tokyo is so full of nooks and crannies. Under most circumstances I do not mind getting lost -- there is always something interesting to look at. 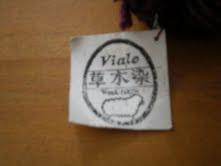 Viale, the yarn store I discovered near the architect's office, was no exception. There is a lovely intimacy about this shop that begins the moment you come inside and trade your street shoes for their woven slippers. A step up leads you into another world. 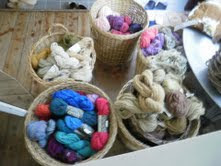 There Viale's treasure trove of yarn, each skein lovingly dyed and spun by the shop's artisan owner out back, are displayed artfully among looms, spinning wheels and beautifully crafted wood furniture. Made of silk and wool, the yarns are all colored exclusively with natural dyes that come from bugs, bark and other goodies. After much deliberation and banter with the proprietress, I selected three shades of purple wool with the plan of turning it into a hat. This is our first winter in Minakami so we have no basis for comparison but by any scale this amount of snow would surely constitute a blizzard. Even our neighbor, Mountain Man Tom, declared this unusual. From my perch at the dining table all I can see is snow. Their dark bark adorned with a wide, white stripe down their backs, the trees look like skunks. The icicles are more impressive than ever. The atmosphere is so white it is almost blue. And the flakes just keep falling. Some are heavy and wet. Others do a little a dance on their way down. Together they cover every horizontal (and not so horizontal) surface. When we arrived on Friday night, the air was full of flurries. But by the time we woke up on Saturday, our world was blanketed with a thick, luscious layer of fresh snow. Pippi and I watched from the living room window as the skiers slid down our steep access road …. in the Jeep! With David at the wheel I knew car and passengers were in good hands. But no traction is, well, no traction. Fortunately a close encounter with a tree brought their little adventure to a halt. No damage occurred but the conditions were clearly not driver-friendly. Needless to say, Pippi and I decided to hunker down. 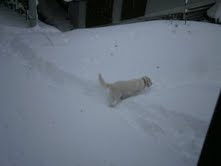 In fact, hiking really wasn’t an option since the height of the rapidly accumulating snow was above Pippi’s shoulders! Just getting her to go out and pee required concerted cajolery. Plus we felt a familial duty to keep the home fires burning. Literally. We didn’t even bother to change out of our PJs. Turned out the skiing conditions were sub par – too cold and too much snow? Is that even possible? Maybe it was the wrong “kind” of snow. By the time we went to bed, there was at least a respectable 15 cm. layer on the roof. But overnight the amount doubled or more. And the snow just keeps falling. It is so beautiful and unspoiled. As you can imagine, there is a right and proper way to do just about everything in Japan. Picking or eating strawberries is no exception. Since the fruit is so delicate and easily bruised, a little instruction in how to free the fruit from the plant is actually not a bad idea. According to one expert, it is all in the stem snapping. You simply place your hand behind the fruit, thumb above the stem and fingers below. One definitive, downward turn of the wrist and voila! The fruit will fall into your palm, unblemished and with its little green frond in place. The proper way to eat a strawberry involves another skill set altogether. Though counter intuitive, the trick is to start from the stem side and work your way towards the tip -- the berry's sweetest and most tender part. I suppose the success of this method really is a matter of taste. Are you a save-the-best-for-last type or eat-the-best-first type? I agree that eating the woody end bit last leaves a less than optimal taste in the mouth. But I also think an argument could be made for eating the best part first when one's taste buds are at their perkiest. The other day the girls and I decided to test out this new information. 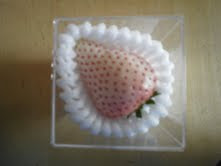 Partly in response to blog viewer demand, I went back and purchased an albino strawberry. On close inspection, the white berry is really quite arresting. Swaddled in Styrofoam and resting on a bed of shredded paper, my berry came in a coffin-like plastic box. The outer skin looked so sickly pale and the seeds so feverishly red! Also, as if compensate for its lack of pigment, the albino berry was oddly aromatic. I almost wondered if its natural smell had been augmented by the growers. Anyhow, after studying the fruit from multiple angles, we cut it open. 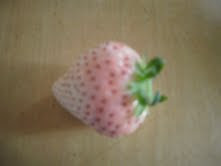 We hoped that maybe we'd find pink or red flesh inside but, like most Japanese strawberries, its innards were pure white. Instead of popping a piece of berry into the mouth, we each nibbled a quarter, starting at the stem end of course! The taste was kind of watery and the texture should have been a touch firmer. I think my poor berry was slightly past its prime. But I am glad we gave it a go before the white strawberry season ends and some other equally odd experiment is engineered for Japan's fruit consumers.